Compact light weight Table Top with easy operations. Available in 3 dia. 400mm, 500mm, 600mm. screen with 90° cross line & chart holders. Projection Light Source with 24V/150W Halogen Lamp. Double Oblique Light Source for Surface Illumination. Two adjustable dichroic reflector lamps 12V / 100W each. Motorised Focussing with 60mm focusing range. High Quality objective lenses. Optical distortion below 0.15%. Standard magnification : 10x, Optional : 20x, 50x and 100x. High Quality European made objective lenses, Optical distortion below 0.1%. 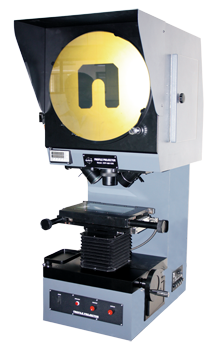 Optional Work Tables for Micrometer Heads & for linear scales with Digital Readout. Cooling by built-in noiseless and vibration free fan. Available in 110V & 220V through low voltage transformers.